Get Ready To Crumble! This Berry Treat Is a Winner! Every now and then you feel like having a nice dessert. I don’t mean after your meal – I mean having just dessert instead of your lunch! What? You don’t get that feeling? Well, I certainly do. And the only way to get rid of it is to make a quick and yummy dessert before your husband gets home and realizes that’s the only meal you’ve had all day. I may or may not have done that today – but if my husband asks, I’ll deny everything. Just kidding, kind of! I did make this incredible berry crumble from the berries I happened to have in the freezer. And I did have only this for lunch today. But I’m not going to hide the dessert from my husband, no way! It’s way to delicious for that. Besides, how am I going to get a second portion of it after dinner tonight if I need to keep it a secret? 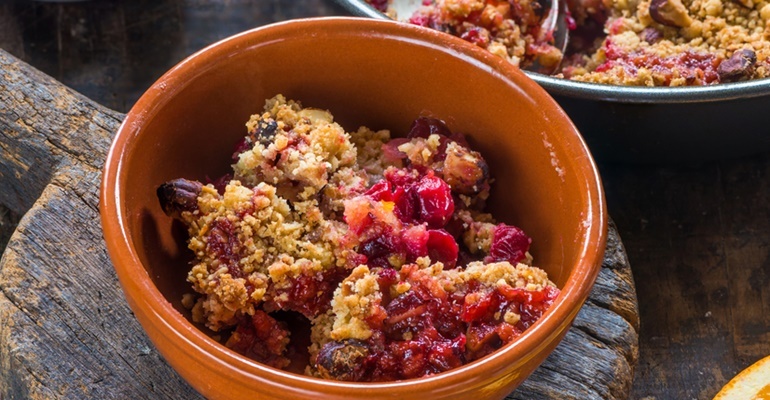 Quick Tip: Use any berries you have at hand for this crumble.